She lives life intensely and will never look back. Aries is the sign that is always up for something. The woman in Aries is restless and impatient. In a group, she will always be the alpha, she will plan and make sure everything is in order. It is only normal for an Aries woman to be the leader wherever she may be going. Courageous and vivacious she has an unmistakable charisma. New challenges are nothing to her and she awaits them with fervor. Her adventurous side is very developed and that’s why you can always rely on the Aries woman to go places and do things. The most famous Aries women include Emma Watson, Lady Gaga, Jane Goodall and Diana Ross. The Aries woman is passionate and she likes being the one that takes care of everything. For this reason, she may sometimes enroll to take on too many projects that she isn’t capable of finishing. She is governed by the first symbol of the zodiac, the Ram, thing that makes this lady daring. However, she may find herself not being able to complete a task because she got too enthusiastic about starting the next one. Optimistic and feisty, she will fight for the underprivileged and she will see behind appearances. She’s not that interested in popularity, she only relies on her beliefs. Mars is also a ruler of this sign. As the first in the zodiac, this sign is one highly charged from a karma perspective. The woman in Aries will be happy with what the future brings and will look back only to learn. People in Aries are born to be leaders. One thing’s for sure, the Aries woman believes in true love and she is searching for it. When she finds it, she becomes the most charming woman the zodiac has ever seen. When first meeting an Aries lady, you will be impressed by her intriguing character and the way she lives intensely. She is a mystery to most of the possible partners as she is complex and interesting to discover. She likes people who are cuddly and she will stay forever next to someone who will prove to her she is the most important. Inside, the Aries woman is more vulnerable than she lets to be shown. She is the one to be impressed by romance and gestures of love. Caring, she expects the same thing from the partner. She isn’t that much into possessive people, but she doesn’t mind a jealousy crisis from time to time as she knows this is a sign of how much you love her. She can be very direct about what she feels and her partner will be the most loved person on the planet. She is self-confident and this will make you want her more. She poses as innocent as she is all the time confident she will get you. This is a turn-on for many. She’s not that innocent in general, but she uses this to make a possible partner lust for her. The Aries woman won’t be attracted by an opposite. This rule doesn’t apply here. She is after someone like her: adventurous and energetic. She won’t sob next you if something is wrong as her attitude is optimistic and she doesn’t like to look back. Many people learn from Aries that the past must be forgotten and the future is the one that matters the most. It is easy to succumb to an Aries woman’s attitude. She is direct in approaching you so you won’t be mistaken if you feel like she desires you to. She trusts people completely when she falls in love, and she is sure things are going to work out perfectly. When it comes to relationships, the Aries woman is after the feelings involved in the chase. She likes to risk some things in love and when she commits she equally gives and receives. Her love is fun and sparky. She needs a partner to stimulate her and she appreciates loyalty the most. As she is impulsive, she will sometimes start insignificant fights just to enjoy the making peace part. If she’s appreciated and respected, the Aries woman will love and respect back. She is a fierce protector and she will defend the members in her family no matter what. She is not the most traditional mother in the zodiac although her children will be cared for and disciplined, as she likes to bring a lot of her personality in the process of raising children. Living intensely, the Aries woman’s friendships will be the same. She keeps people close to her and she likes helping. There are many friends in an Aries woman’s life as her interests are constantly changing. Her volatility makes her interesting for others, thing that will help with making new friends. The fact that she is so independent may scare some of her girlfriends. Because the Ram is ruling her, the woman in Aries will always be the pack leader. She will know how to give orders and she will be appreciated at work. As she is always interested in what’s next, this woman will not be good at jobs that require routine behaviors. Everything needs to be a challenge for her, so she would be good as an ER doctor, stock broker, lawyer, chemist and entrepreneur. She needs financial independence just like she needs independence in other areas of life. Money will never form part of concern for the Aries woman. She simply doesn’t stress with putting aside and she is sure she will always make the money. This woman is very generous with the people she loves. 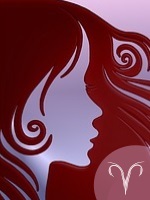 The woman in Aries will get red in face when going through an emotion. She is always fit and aware of the fact that she needs to exercise. She likes sweets, this being the reason why she should be careful with her blood sugar levels. Since her sign is linked to the head, she may come across headaches more often than others. Always in trend, the Aries woman likes to talk about fashion. She will be the trendsetter in a group, adopting the most extravagant styles. She looks good in red, which is actually the representative color of her sign and there are many fabrics in her wardrobe. The gemstone associated with her is, no wonder, the diamond, which represents purity and power. She may not reach to that stage of affording diamonds early in life, but when does, she will know to appreciate their value. Are Aries Women Jealous And Possessive?